Cholangitis - which means inflammation of the bile ducts. In this condition, the bile ducts both inside and outside the liver become inflamed and scarred. The scarring causes narrowing of these bile ducts which results in bile building up in the liver. The bile can then damage the liver cells. Eventually, the scar tissue can spread throughout the liver, causing cirrhosis and liver failure. It's not clear what causes primary sclerosing cholangitis. It's believed that the condition may be caused by an immune system reaction to an infection or toxin in people with a predisposition to develop the disease. Primary sclerosing cholangitis occurs more frequently in people with certain other medical conditions, particularly inflammatory bowel disease. It's not clear how these conditions are linked and whether they share similar causes. Primary sclerosing cholangitis may not cause any symptoms in its early stages. In some cases, the only indication of this disorder may be abnormal blood tests suggesting that your liver isn't functioning well. Your age. Primary sclerosing cholangitis can occur at any age, but it's most commonly diagnosed in people ages 25 to 45. Inflammatory bowel disease. The great majority of people with primary sclerosing cholangitis also have inflammatory bowel disease, which includes ulcerative colitis and Crohn's disease. Still, primary sclerosing cholangitis is rare among people with inflammatory bowel disease, and most won't develop primary sclerosing cholangitis. It's not clear why these diseases occur together. If you've been diagnosed with primary sclerosing cholangitis, your doctor may recommend testing for inflammatory bowel disease, even if you have no signs or symptoms. What are the complications of primary sclerosing cholangitis? Deficiencies of some vitamins, usually vitamins A, D, E and K. These are the vitamins which are fat-soluble (rather than the other vitamins which are water-soluble). This means they dissolve in fat. Bile helps the fat to be broken down and these vitamins to be absorbed. Infection of the blocked bile ducts. This is called infective cholangitis. This may cause chills, fever and upper tummy (abdominal) tenderness. Cirrhosis (where normal liver tissue is replaced by scar tissue (fibrosis). Bile duct cancer. This eventually affects around 1 in 10 people who have PSC. 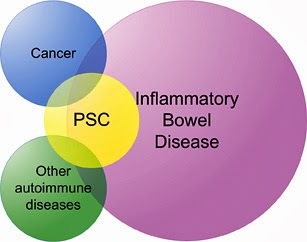 Many people with PSC have no, or only vague, symptoms for quite some time in the early stages of the disease. Therefore, the diagnosis is often made when you have tests for an unrelated condition or routine tests if you have inflammatory bowel disease. Blood tests called liver function tests. These measure the activity of chemicals (enzymes) and other substances made in the liver. This gives a general guide as to whether the liver is inflamed, and how well it is working. See separate leaflet called Liver Function Tests for more detail. Other blood tests may be performed to rule out (exclude) other causes of liver conditions such as viral hepatitis. An ultrasound scan of the liver may be performed. Taking a small sample (biopsy) of the liver. This may be carried out to look at the sample under the microscope. It can show inflammation and the extent of any cirrhosis (where normal liver tissue is replaced by scar tissue (fibrosis) in the liver). The liver biopsy can also assess how early or advanced the disease is. See separate leaflet called Liver Biopsy for more detail. What is the treatment and Drug for primary sclerosing cholangitis? At present there is no specific treatment which either cures or slows the progression of PSC. Treatments aim to improve symptoms and also to manage any complications which may arise. Bacterial infections can occur frequently in people with primary sclerosing cholangitis. Antibiotics may be prescribed to treat an infection. If you've had repeated infections, your doctor may recommend antibiotics before procedures that are likely to cause infection, such as endoscopic procedures or surgery. Primary sclerosing cholangitis makes it difficult for your body to absorb certain vitamins. Even though you may eat a healthy diet, you may find that you can't get all the nutrients you need. Your doctor may recommend vitamin supplements that you take as tablets or that you receive as an infusion through a vein in your arm. A liver transplant is the only treatment known to cure primary sclerosing cholangitis. During a liver transplant, surgeons remove your diseased liver and replace it with a healthy liver from a donor. Liver transplant is reserved for people with liver failure or other severe complications of primary sclerosing cholangitis. Though uncommon, it's possible for primary sclerosing cholangitis to recur after a liver transplant. Quit smoking. If you don't smoke, don't start. Talk to your doctor about any herbs or supplements you're taking, since some can be harmful to your liver. Clinical trials are research studies that test new ways to detect, prevent or treat disease. Mayo Clinic conducts more than 3,000 clinical trials and research studies each year and often coordinates national clinical trials with other medical centers. Learn more about clinical trials and whether Mayo Clinic may be conducting a clinical trial related to your condition or procedure. Primary sclerosing cholangitis (PSC) inflames, scars, and blocks bile ducts inside and outside the liver. Treatment includes medications to treat symptoms and complications of PSC.